This is a compilation of thank you emails, featured fido winners, and yelp reviews, and tips on our ﻿﻿KCRA 3 A list﻿ competition﻿. Eleza and Anny are the best trainers, patient, stern and in tune with your dogs personalities to optimize their learning abilities. They make the training fun for both the dogs and their owners. Paws in Progress offers a wide range of training courses, social skills, pack walks, day drop off, etc. We are now able to handle both dogs when we travel. Thank you Eleza and Anny for the great training and everything you do for our 2 Goldens! When we say Eleza's name they perk up and run right for the car! Sean, Brenda and the girls "Cassie and Callie"
Absolutely the best dog trainers providing the best dog training available in Northern California. Eleza and Anny are truly gifted and have an amazing way with every dog they encounter. They have worked wonders with our two pups. We are thrilled to be part of the Paws in Progress family! 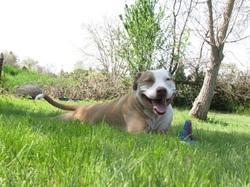 ​I have learned SO much about caring for my dog, Watson. For over 30 years I have been an oncology nurse and around stressful and difficult situations every day. Now that I have retired and have been working with Paws in Progress through classes and activities, I feel so refreshed and rewarded to work with Watson and have him trained and socialized to be a most pleasurable companion that I can take with me almost anywhere. We were at an all-day picnic yesterday with some friends at a park in Carmichael which had tons of people, dogs, the occasional horseback rider, etc. Miss Molly was so perfect that every single one of our friends commented on the amazing difference in her...almost a year ago we were at the same park with the same group of friends and Molly was barking, lunging, throwing fits at every dog that she saw, plus a thirty minute massive freak out when two horseback riders went by...this year, she was so well behaved that even when two off-leash dogs came sniffing around our table, she just sat by me and wagged her tail a few times! So, thank you, thank you, thank you for everything you've done! We really appreciate your help with training us (and Miss Molly). Eleza is absolutely amazing! I have a very stubborn and EXTREMELY energetic (she can run 9 miles without tiring) English Pointer named Abby who Eleza is helping me calm in the house. After only 1 lesson, Abby's energy level in the home has gone down noticeably. Before meeting with Eleza, Abby would be running around the house like a crazy woman and now she's able to stay in her "place" for 30 minutes and actually falls asleep. And Abby was also a notorious puller on the leash and Eleza got Abby to walk calmly with her at her side in a formal heel within seconds. I have never seen Abby like this and actually went into tears because I never thought it was possible with my dog. Abby and I obviously have a long way to go still, but thankfully we have Paws in Progress every step of the way. We can't thank you enough! We started Basic Obedience and playgroups with Eleza a few months ago and have moved onto Advanced Obedience and will start the CGC class with Eleza next week. Maxx has improved greatly since we met Eleza, not only is he more obedient but he has also learned manners playing in her playgroup. Thank you Eleza! Excellent dog training. Eleza really has a way with dogs. It is amazing how they respond to her. In fact, I think she speaks "dog". She is confident and obviously loves what she does. We have taken Basic and Advanced and will go back for Intro to Agility and Paws Perfected. My dog loves her playgroups which are well controlled, safe fun. My dog has gained much needed confidence by Eleza's help. 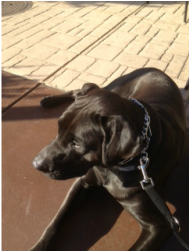 I adopted a Black Labrador mix from the Placer County Animal Control in January. After a delay due to kennel cough and then restriction from being neutered, this boy was more than a handful. He had no obedience training prior to coming to us. I originally thought he was 1.5 years old only to find at his new puppy vet visit that he was only 8 months old. He was very energetic, friendly, strong and still growing! 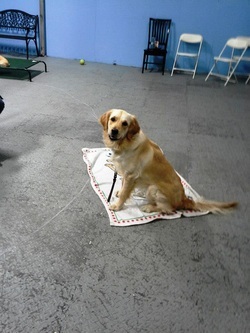 We enrolled in Basic Obedience in January and started attending play groups. He quickly settled into his new manners and allowed behavior. We just graduated from Advanced Obedience last week. We also had a home visit to learn how to manage the interaction with my older dogs. Although he is still a puppy and still learning, he is such a great pet now. He is able to play tough with big dogs, play nice with old dogs and even go shopping at Home Depot. Eleza has been a god-send for us. She has been able to teach me (and my dog) so many new things. She has an enternal source of patience, great sense of humor and straight-forward demeanor. I have recommended her to so many people, including co-workers and friends, it was time to get on Yelp and share. I just took this dog on his first camping trip. We went to a Paws Perfected class just before leaving for a little "tune up." He was so well behaved, I even had people complimenting him. It was such a treat to get to take him along instead of being a chore. I am so glad I found Eleza and Paws in Progress. Just wanted to pass along a thank you. stewie and I are enjoying the nice weather by sitting outside at the fountains. it is such a pleasure to have such a well behaved dog. I wanted to let you know - the girls got adopted - together. I had seen a post looking for two large dogs, they wanted bonded dogs. I sent them pictures and the girls bio, we went to the house on Sunday, they loved the dogs and the dogs seem to be in heaven. 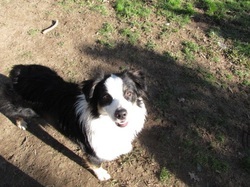 The live on 10 acres in Placerville, the dogs have a very large, very "natural setting" , they can dig and nobody cares, being lab mixes - they dig. So, the fact that we had been working with them seemed to make a really big impact, they were impressed. The girls did not jump, they can walk on a leash, they were calm. So, thank you for assisting us, it did seem to seal the deal that they were sort of trained. Thank you for what you do - without affordable help, people like me would not be able to help strays. LOOOOVE Eleza. I have worked a couple other trainers in the area and we didnt get anywhere. Eleza helped turn my wild and crazy aussie pup into a wonderful dog. From agility to canine good citizen, she is outstanding! Paws in Progress is great! Eleza is great with the dogs and their owners. 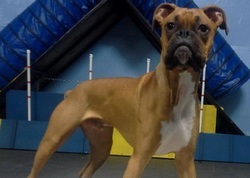 Bentley, our boxer, loves Paws in Progress obedience classes and play group! The field trips are great for the dogs and their families! Paws In Progress is AMAZING! They are helpful, patient, and do not give up on you (or your pet). I have seen Eleza work with all types of dogs through my various levels of training with her, she is always professional. You can really tell that she values the relationship that she is helping to create between you and your dog. If you are thinking about getting a puppy, I highly recommend starting with Paws in Progress's 'Puppy Preschool'! You'll be hooked on using their services from there! 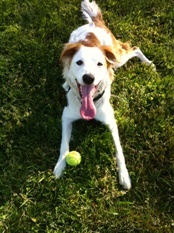 Cali is a 14 month Aussie Brittany Spaniel mix. Cali is my first dog. I've never considered myself a dog person; in fact, I'm pretty much the opposite. When my boyfriend wanted a puppy I wasn't exactly excited. We ended up with a typical puppy--cute and loveable, of course, but bitey, jumpy and wild on a leash and off--she was your basic disaster on four legs. I was at a total loss as to how to control her and how to get her to obey even basic commands. We lucked out when we found Paws in Progress. 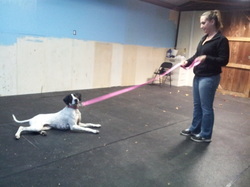 We started with Basic Obedience and within the first five minutes of class Cali was sitting on command! Fifteen minutes later, she was walking with me on the leash, instead of running circles around me. I was in awe! Eleza made sure we understood the "hows and whys" of giving each command and that we were comfortable with the techniques. If we weren't, she would offer alternatives within our comfort zone. At each session Eleza provided great tips, letting us know what behaviors we could anticipate and how to deal with negative ones quickly and effectively. She was always willing to answer question and, believe me, we had plenty food, vets, toys, treats, you name it. Basic Obedience made me realize, with the right instruction, Cali was trainable and during those first few months, I probably learned just as much Cali. 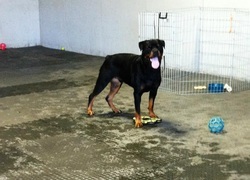 After Basic Obedience we completed Advanced Obedience, Intro to Agility, CGC Training and a private lesson. As Cali got older, there were several commands (“drop it” and off-leash recall) that were extremely important to me. Throughout the various training classes Eleza worked with us to address these issues and Cali quickly mastered both of them. I have high standards for what I consider “good” dog behavior and with Paws In Progress Cali has met or exceeded all of them. These days Cali is an amazing dog! She is well-behaved, outgoing and very friendly. Now that we’ve completed the all basics, what we appreciate most about Paws In Progress are all of the extras that are offered. We are playgroup regulars and attend as many field trips as possible. We also love the free refresher training sessions (Paws Perfected) on Saturdays. One year later, Cali is joy to be around and I actually look forward to spending time with her. I am amazed at how far we have come. Thank you Paws In Progress!